I’ve always loved Transformers. Optimus Prime, Bumblebee, Hot Rod, the lot. When I was a kid I collected them, once narrowly missing out on an original Megatron (used of course) at the Corn Exchange in Manchester due to not having the requisite fiver, though I partially made up for that by hunting out several of the Dinobots hidden deep in the shelving on the second floor of Boydell’s toy store in Bolton. Once in Boston, MA I found a used Soundwave (tape recorder) and snapped it up at once, along with I think Ravage the puma-tape, but I’m not sure, maybe it was Laserbeak (the pterodactyl). Anyway. 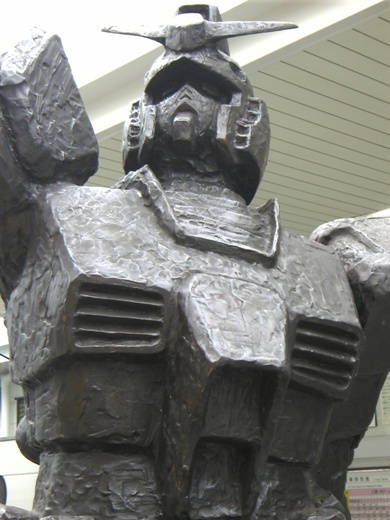 Gundam (war story) are not Transformers. They are not NEARLY as good as Transformers, because they don’t transform. But, they are the next best thing, and in robot form at least look remarkably similar. 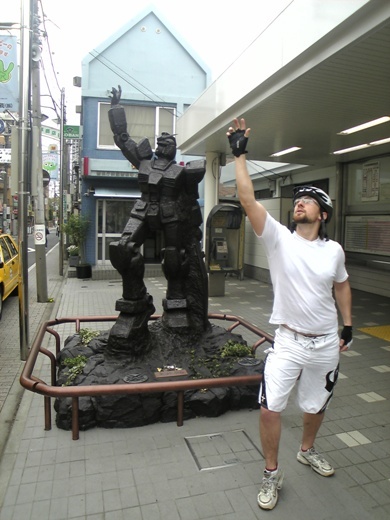 So- when I heard about this bronze 3 meter tall statue of a Gundam robot in front of a nearby train station: Kami Igusa (upper soft reed) in Suginami-ku (cedar avenue city), I knew I had to make the pilgrimage. So I hopped on my bike, and pelted out. Unfortunately, the first time I’d mis-read the kanji and ended up in Shimo-Igusa (lower soft reed, dammit!). So the next time I set out with a friend and the correct Kanji, and hunted him down! Here he is hailing a taxi. Here’s Mike with bike helmet and shades. Nicely co-ordinated, yes? Notice the coin-box at the statue’s feet. 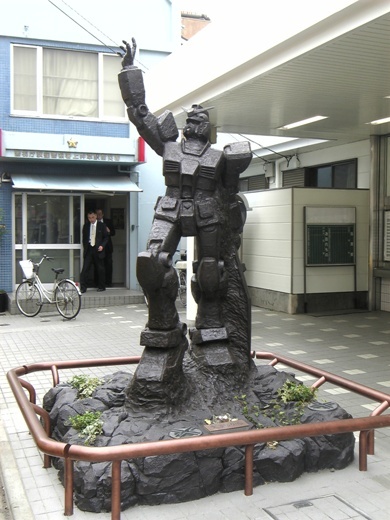 These are offerings to Hachiman (the God of War), of which Gundam is one official representation. Japanese people (mostly salarimen) put money in this box when heading to an important business meeting- for good luck in defeating the foe (the opposing company). Here we are doing the Night Fever dance. If you like this post- check out other ancient/modern slices of the Japanese cultural pie in the culture/events gallery. Also, why not click one of the bookmarking links below, to let other people know about this great little post? Thanks! Jason took the ones with me in, I took the other two. We rode down together. That robot is talented. And deep. Actually, some mobile suits (term used for Gundams, Zakus, etc in the series) DO transform. Maybe not in the complicated style of Transformers but they still “transform” in a way. 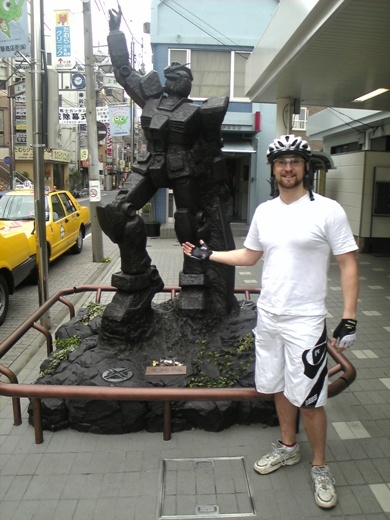 One example is the RX-78-2; the first Gundam ever in 1979 the statue is based on.